After doing research for Budapest, we decided three nights would be best. It is a fairly compact city, but some sights are somewhat far apart (similar to London). The tram system makes it easy to do less walking though. The city used to be two different cities - Buda and Pest which were separated by the Danube River. Each is still referred to its own to make things easier. 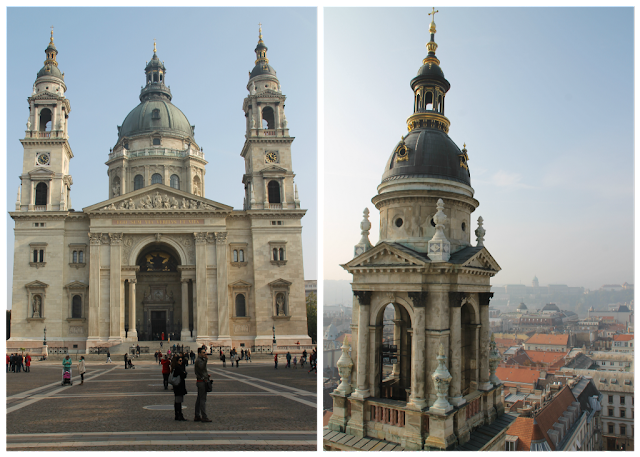 Buda is where the castle is located, and Pest is where the gorgeous parliament building, cathedral, the majority of good restaurants, and the ruin pubs are located. We chose to stay on the Pest for obvious reasons. After booking our AirBnB, we realized it could fit four people, so we invited our travel buddies, Jill and Ryan, to join us. It was a bit small for four people, but it was manageable... but the best part was the price! I'm talking $40 per couple per night - Budapest in general is CHEAP! I normally don't mention the cost of things on the blog as I feel it is very personal, but that number is worth noting! The second best part of the apartment was its location - smack dab in the middle of almost everything by Deák Ferenc tér (a transport hub)... and an easy walk to/from the ruin pubs. Priorities. Luke and I arrived around lunch time on Friday, so we stopped for lunch recommended by our British AirBnB host. We headed to the grocery store to pick up breakfast supplies, then checked-in to the apartment. It was going to be a few hours before Jill and Ryan arrived, so we decided to get a start in the city. We took a walk down Váci utca, a pedestrian shopping street, until we reached the Szabadság híd (Liberty Bridge) where the Central Market is located. We walked along the river and passed by the Elizabeth Bridge. 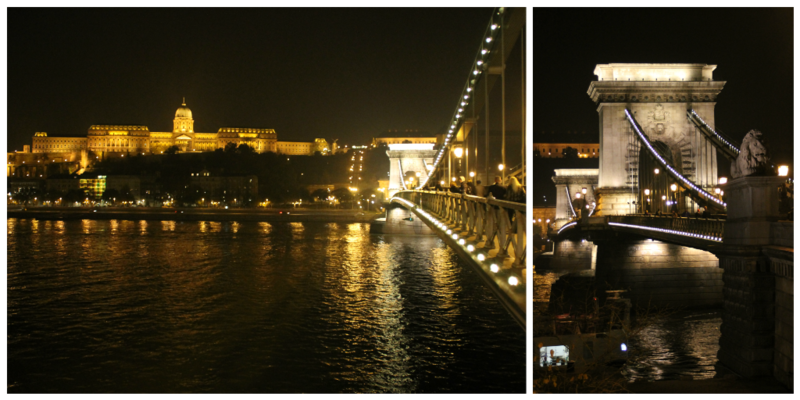 Then, we reached the Chain Bridge (Széchenyi Lánchíd). All of these pretty bridges!! 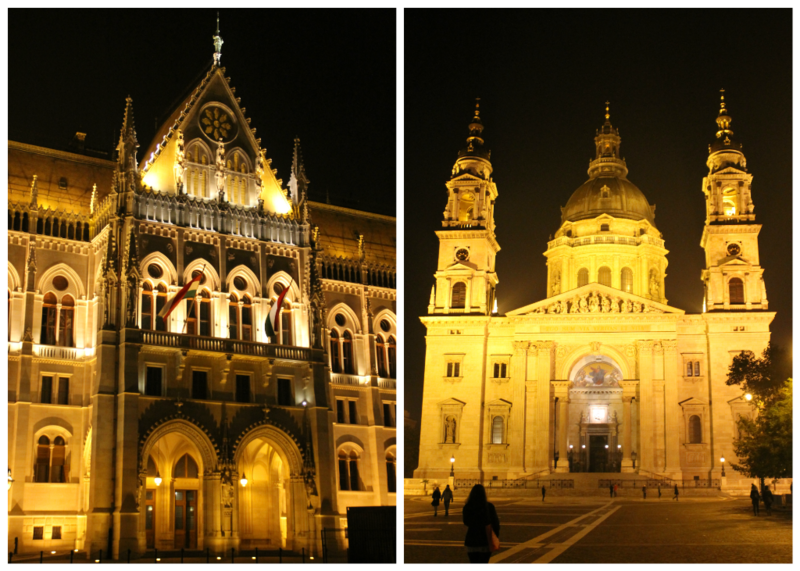 Along the way, we saw a beautiful sunset over Buda Castle! Jill and Ryan's flight had landed so we decided to find a spot to meet them since they didn't know where the apartment was. We sent Ryan a message telling him where to meet us, and told him to validate their bus tickets into the city. He got so confused about it, so we had a good time joking with him. Later, we realized their bus journey was not as pleasant as ours and joking with him probably wasn't very helpful. (Note: Make sure to validate bus tickets.) Anyway, we met at Langford Pub just across the street from the apartment before dropping the bags and heading out for dinner. I had noted a few restaurants on my map, but did not make reservations anywhere. We decided on Kolor Projekt which is located in the area with all the great pubs and bars. After dinner, we did some walking around and settled on a few drinks at Szimpla Kert ruin pub. This ruin pub is one of the coolest things I have seen! An old ruined building that has somehow been transformed into a bar. Inside was all sorts of different rooms, many with their own bar. Some rooms were quiet, some were loud, some were smokey, some were standing room only, some had couches, some were inside, some were outside. It is really difficult to explain, but I easily could have stayed for hours! Unfortunately, we only stayed for a short time as we all had gotten up early that morning to travel. We made a plan to come back the next night with our game faces on! On Saturday, we made breakfast in the apartment, had our coffee and tea, then started our day. 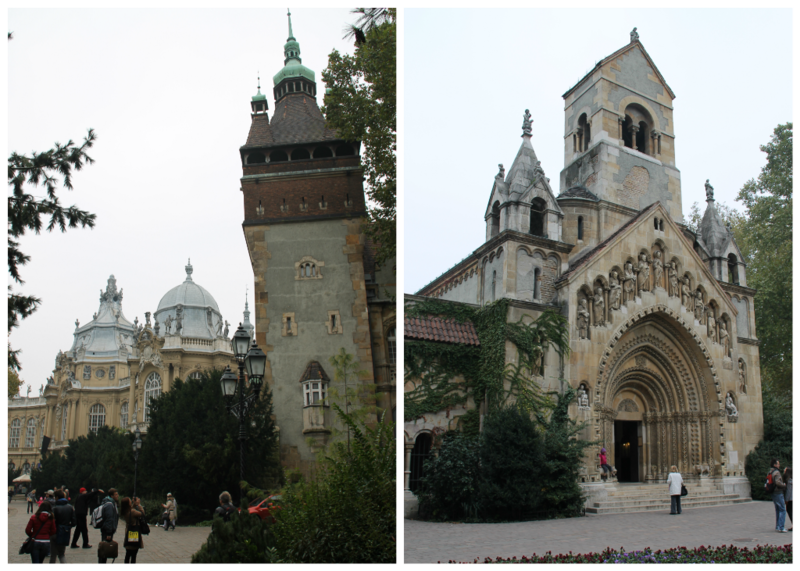 We walked to St. Stephen's Cathedral first. The elevator took us up to the rooftop where we got great views of the city around us. As it was October, the usual haze and fog were in full force, but it made all of the steeples pop out over the buildings. Afterward, we headed toward the river. 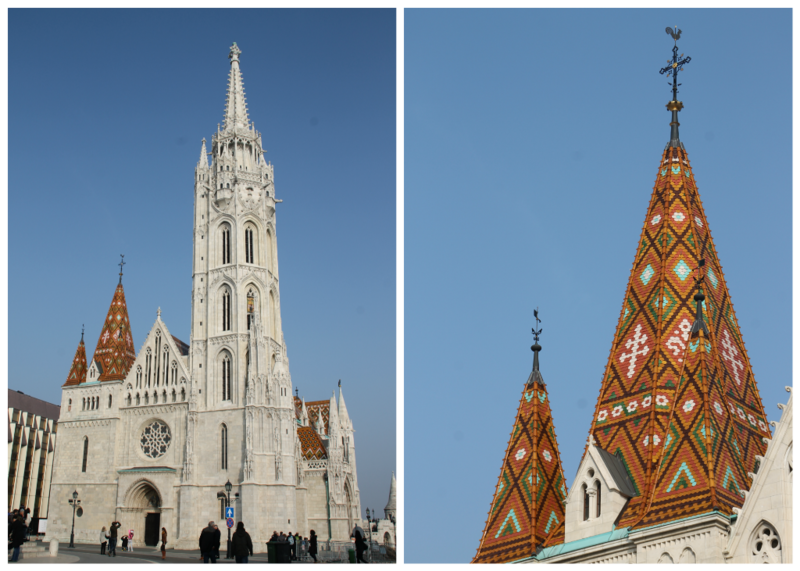 Nearby are some gorgeous buildings - in fact, Budapest is the second most gorgeous city I have been to (after Prague, but Budapest is more of a mature gorgeous, Prague is more colorful). We crossed the Danube at the Széchenyi Lánchíd (the iconic Chain Bridge) to Buda which put us right at Buda Castle. The castle is a one of those kind that is a group of buildings (like Prague and Vienna), so it is free to get onto the grounds. 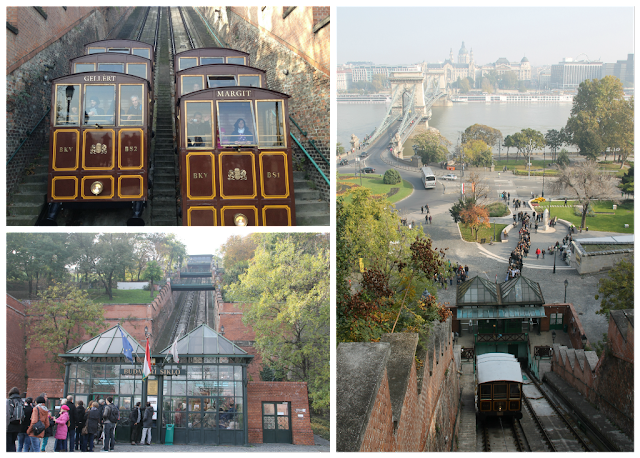 The line at the funicular was very long, so instead of waiting and paying, we took the short walk up the hill. It's always nice to get extra exercise while traveling. We walked around a little bit to check out the views and look at the buildings surrounding us. 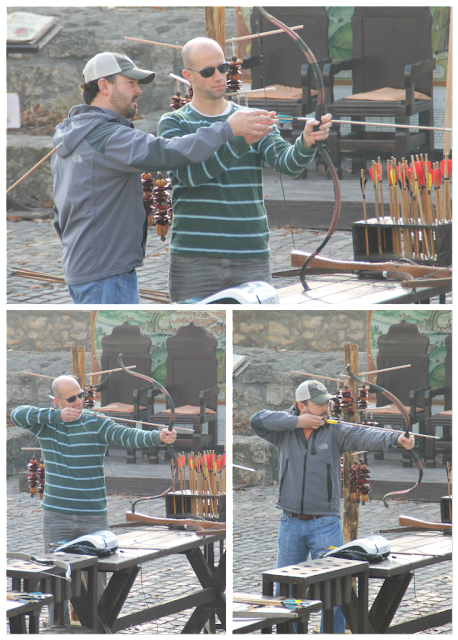 We stumbled upon an area where you could shoot a bow & arrow. Ryan is a hunter, so it was natural for him, but Luke needed a little lesson. Jill and I watched as the boys did their boy thing. A short walk later, we came to Matthias Church with its colorful tiled roof. The towers were very tall! Behind the church is the Fisherman's Bastion where we got some of the best views across the river toward Parliament. This is probably one of the best spots to visit in Budapest. We were all getting a bit hungry at this point, so we decided to have lunch at the highly rated Pest-Buda Bistro. As it was October (in fact, it was Halloween), it was pumpkin season. Everywhere we went had Pumpkin Soup on the menu. Pest-Buda was THE BEST pumpkin soup ever! I want to go back to Budapest just to have this soup. Totally worth spending the hefty $40 a night to stay in Budapest to eat this soup! hah This was also our most expensive meal of the trip which came out to probably 1/4 of what we normal spend when we eat out in London. CHEAP! After lunch, we were finished with the castle area, so we walked back down the hill at the far north end which put us just a short walk away from the river right across from Parliament. It kills me to say it (because I love the British Parliament building), but the Hungarian Parliament building is the most gorgeous building there is! The pictures dont do it justice, and at night, wow! Take a better look. 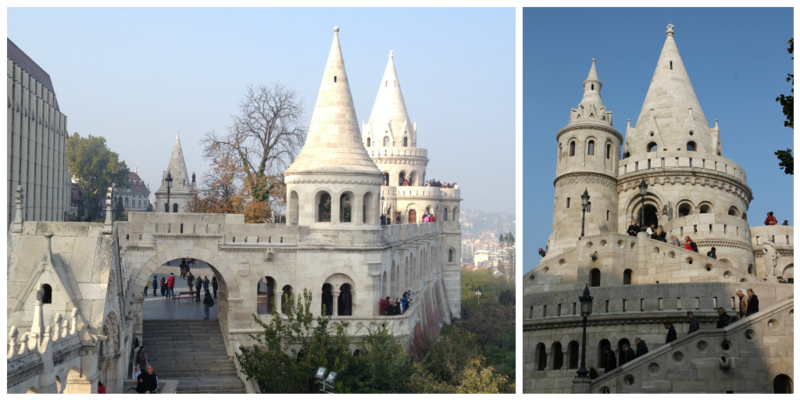 We walked on the Buda side of the river back to the Chain Bridge. 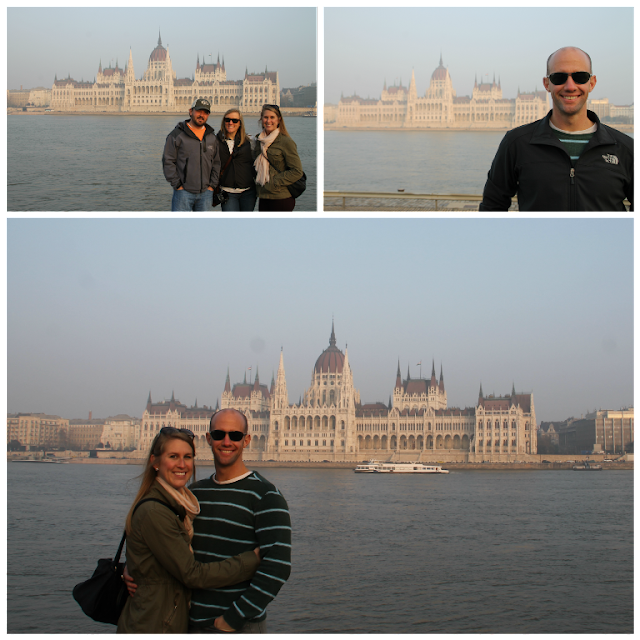 We crossed back to Pest, and walked toward Parliament to get a better look. 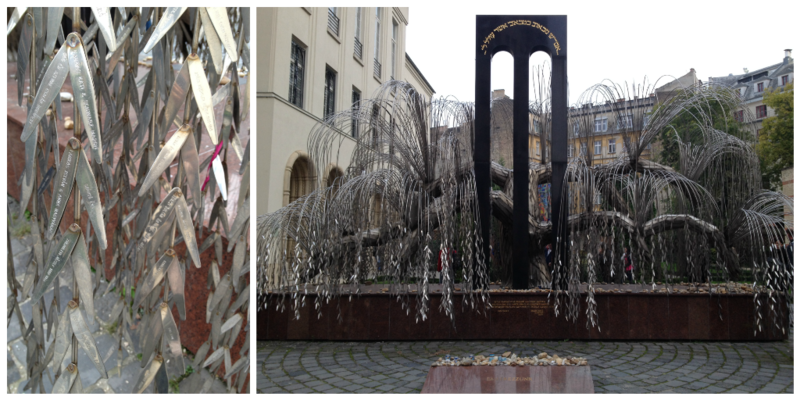 Along the way, we passed the emotional Holocaust memorial, Shoes on the Danube. A very large amount of the Jews murdered during the Holocaust were from Hungary. Many were executed at the river, and asked to remove their shoes before they were killed. It was about time for sunset again, so we got a great shot of it across the river as we stood next to Parliament. 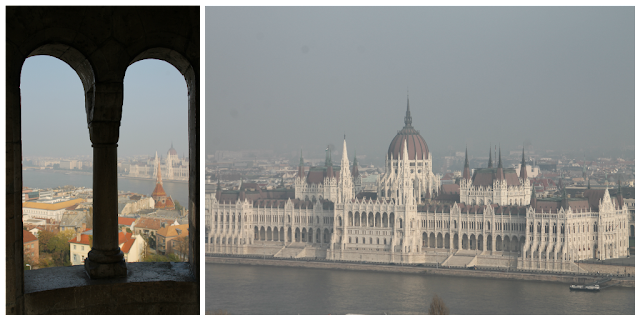 I have yet to mention how cold it was in Budapest during our visit. None of us were quite prepared for such cold temperatures (in the 40's), so we hovered around an air vent from the metro that blew out hot air as we watched the sun go down. Not too far away was Strudel House, so we decided to go warm up with a snack. 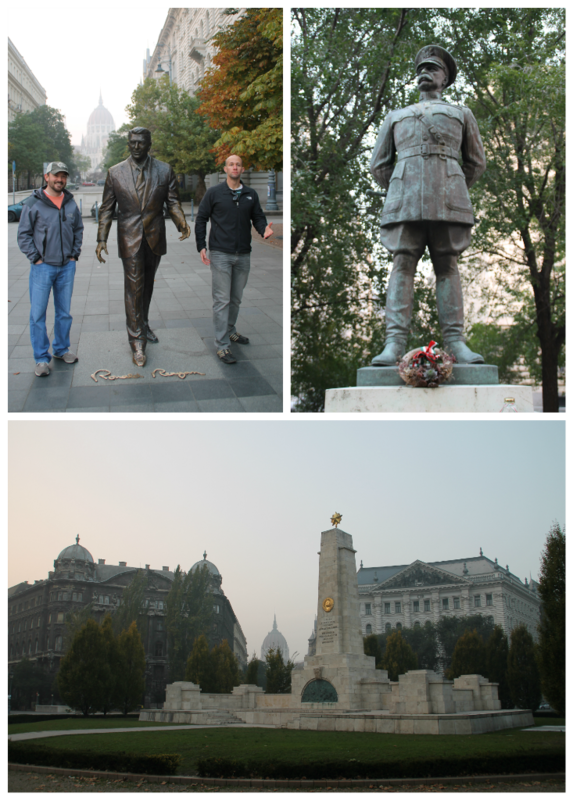 Along the way, we saw a statue of Ronald Reagan and the US Embassy. We sat for a strudel snack at First Strudel House in Pest for a while and decided to go back to the apartment to grab some warmer clothes. Around the corner from the apartment was a market, so we visited the Elizabeth Market for a few minutes. Then, we headed to dinner at Castro Bistro before making our way back to Szimpla Kert for drinks. Jill and I left to go back to the apartment for the night after a few drinks, meanwhile, the guys decided to stay out for guy time. Until 3am! When Sunday rolled around, the guys struggled to get out of bed which resulted in Jill and I nagging them to get up. 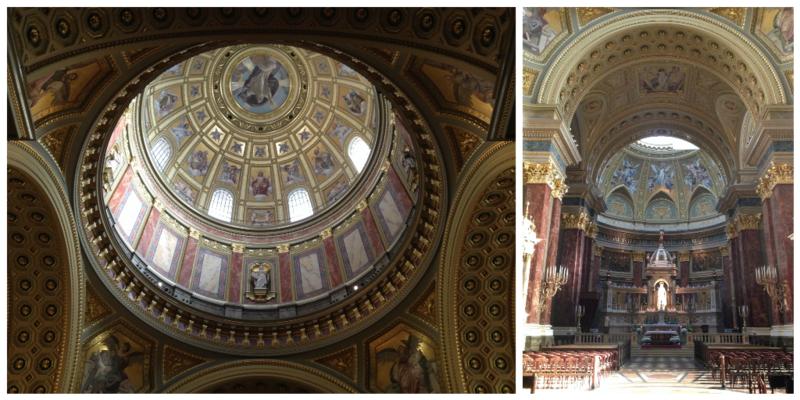 We were not wasting our day in Budapest because they decided to party. We hopped on the metro to Széchenyi fürdő where one of the most popular Hungarian baths is located (Széchenyi Bath & Spa). I originally wanted to go to a bath (which is basically like a heated pool), but decided against it after reading some disgusting things about it. I don't think it's that awful, but since the boys were hungover, it was best that we didn't sit in a steaming pool of water for a few hours. We walked in the park and saw the castle instead. Then we walked to the very wide open Hero Square, which is actually a UNESCO World Heritage Site. The walk back was really long, so we got back on the metro to Opera and had lunch at Cantine. 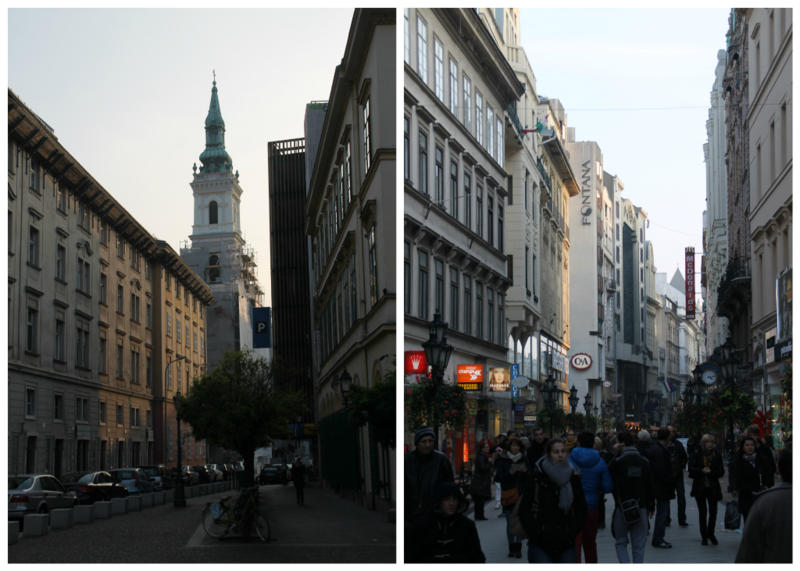 We took a walk thru the Jewish Quarter which is the same area where all of the bars and ruin pubs are located. We decided to stop in to our ole favorite, Szimpla Kert, to see it during the day. Meanwhile, the boys couldn't handle going in as it reminded them too much of the previous night. haha It definitely smelled like a party had happened the night before and definitely wasn't as appealing in the daylight! Some things are better left to be seen only at night, and Szimpla Kert is one of them! Nearby the ruin pub was the Synagogue which has a unique Holocaust memorial in its courtyard. We did not go inside the actual synagogue because it was closing, but the pictures of it look beautiful and it is apparently the second largest in Europe. We decided to give the boys a relief, so we headed back to the apartment for a few hours for a nap. After the sun went down (around 5pm), we headed to the river to see all of the beautiful building lit up in the dark, and strolled along in cold. We decided to do an easy dinner at the market in the Elizabeth Square. 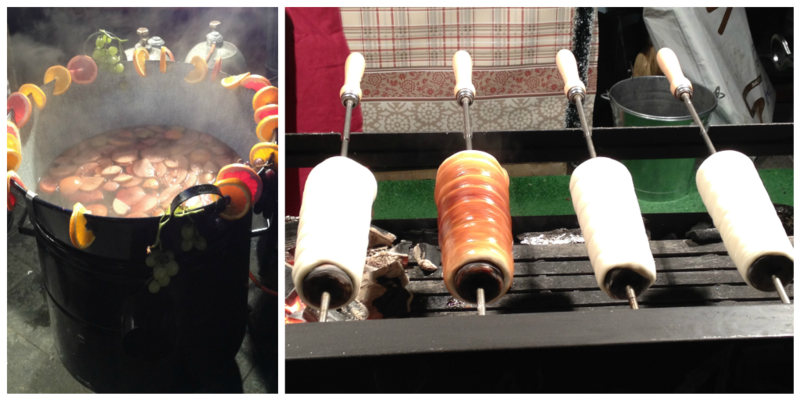 We munched on goulash, sausages, Lángos (similar to pizza), Kürtőskalács (Chimney Cakes), BBQ, and drinks. We didn't stay out too late since we were all very tired from the previous evening. Jill and Ryan left for the airport around 10:30am on Monday, while Luke and I still had a few hours in the city. He and I left the apartment not long after Jill and Ryan, and went to the Fővám Tér Piac (Central/Great Market Hall). As with other buildings, the roof was decorated with colored tiles, and the inside was two levels of food and shopping stalls. We decided to do a bit less walking, so we hopped on Tram 2 which runs along the river. We were able to quickly see the beautiful architecture along the river one last time before we hopped off at Parliament. 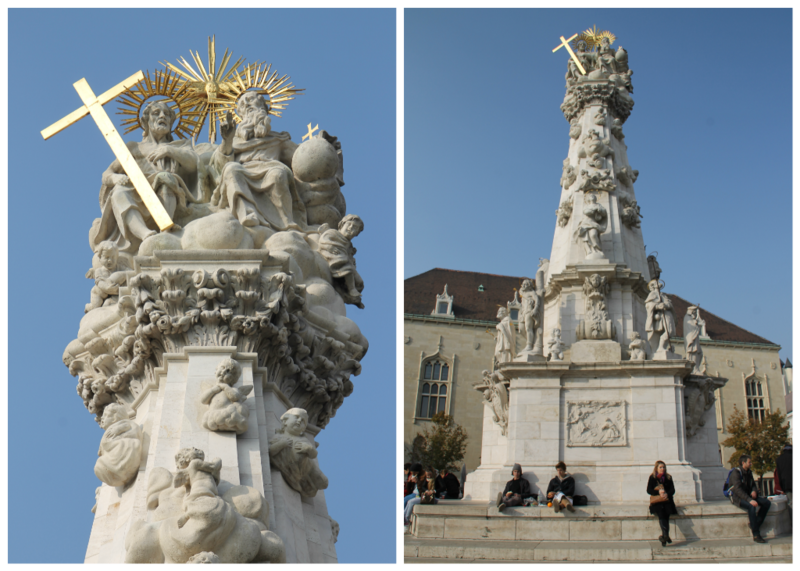 We took a walk to the middle of the Margaret Bridge, which is where you access Margaret Island which splits the Danube. We just wanted to see Parliament from a different angle though, so we did not go onto the island. Afterward, we walked back toward the cathedral, and stopped for lunch at Lugas Cafe (a restaurant with tons of food for little money). It was time we headed to the airport to fly back to London. We absolutely loved Budapest! It is one of the prettiest cities we have visited, has the best nightlife we have experienced in our travels, and of course it was super inexpensive. It was great to enjoy a new city with Jill and Ryan, and I'm so glad we invited them along! We would love to go back to Budapest, but we may have to put a stop to visiting Szimpla Kert again! 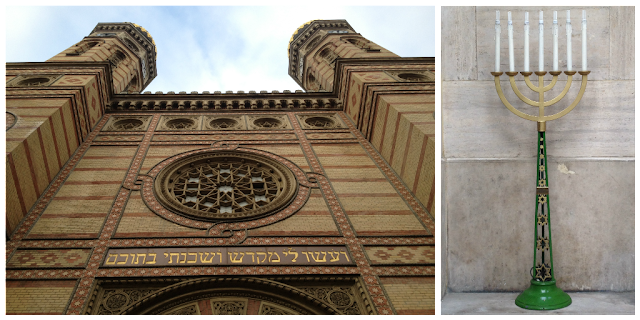 Budapest is pronounced Budapesht (but I still haven't caught on with that).